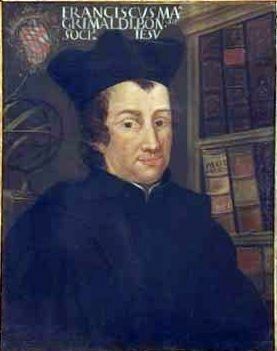 In 1665, Francesco Maria Grimaldi, an Italian Jesuit priest, conducted a simple experiment the results of which went on to occupy the minds of several generations of physicists, including Newton and Einstein. The experiment consisted of light entering a dark room through a small slit and projecting onto a white screen. Grimaldi’s objective was to test if the width of the beam was the size predicted by the light beam’s geometrical path. To his great surprise, Grimaldi found that the beam of light illuminating the screen was larger than expected. Strangest of all, however, was that the light was no longer white, but became two or three rays of different colours. Without knowing it, Grimaldi had conducted the first experiment into the splitting of light. He assigned the term “diffraction” to the phenomenon, a term that survives to this day. Grimaldi later realized that diffraction is a phenomenon that does not only occur when light is projected through a slit; instead, it occurs each time light strikes the edges of any object. Several scientists were interested in the effect but none could explain it. The answer was not long in coming, however, and it was Isaac Newton himself who would provide the explanation. In 1662, Newton began his own optical experiments. One of his first projects was to construct a refracting telescope. He polished lenses and attempted to improve the instrument by getting rid of the coloured fringes that would appear on the margins of his images (he did not succeed and decided instead to develop a mirror-based reflecting telescope). In 1666, during one of his optical experiments, Newton passed sunlight through a prism and split the light beam into different colours, like what he observed along the edges of his optical lenses. 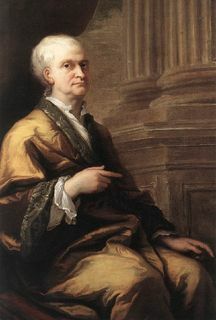 Others before him had conducted similar experiments, but Newton was the first to understand that white light consists of a mix of light rays, each with a different colour. Newton also understood that white light can be separated into its components because each ray of colour is deviated by the glass of the prism by a different amount. He realized, for example, that red light is consistently less deviated than violet light. As a result, Newton understood that when white light passes through a transparent medium (like air) into another (like glass), its components are deflected the first time according to their colour, and once again when they reemerge (back into air, for example). This creates a spread of coloured light rays from red to violet, like the colours of the rainbow. 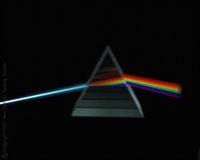 This ordered separation of coloured rays is known as the “spectrum”. The spectrum of white light consists of six basic colours arranged in a specific order: red, orange, yellow, green, blue and violet. Although Newton understood that a beam of light of a particular colour is always deviated by the same amount, he did not appear to understand why this is so. More than a century would pass before another British scientist by the name of Thomas Young would provide part of the answer.